On occasion, the practice has found me genuine love. Sometimes, it has found me something masquerading as love or, shall we say, temporary, convenient love. And most often, it has found me either some good friends or a lot of rudeness/weirdness. Whatever. Like anything else, it has its ups and downs. Today, however, I decided to file through my memory and figure out exactly what sites I have used over my long dating career, and to pare them back. See, sites come and go, and many don’t last past a few months of popularity. They’re sort of like night clubs in that sense. Ironic, no? I spent the day deleting profiles. I hadn’t realized I’d joined so many over the years! Most of them I’d never actually used beyond the first visit. But their nature is such that you can’t even browse them without first becoming a member. The most frustrating part in this purge has been how difficult it has been to delete profiles. Some sites don’t actually allow you to do so; you can only hide them. This, of course, gave me licence to write some nasty letters to site administrators. The nerve. Then I decided to try a little experiment. I value education highly in my friends and potential mates. Formal education has been a hallmark of my life, after all, and the promulgation of higher education is now my career! So on one very popular site, I decided to do a global Canada-wide search of all women who claim to have a PhD or doctoral degree. And hilarity ensued! About half of them were under 22 years old. Either these are all brilliant savants or prodigies, outright liars, or they mistake a PhD for a “poser hatin’ degree”. At least one of those, upon closer inspection, was clearly a prostitute. Now, that doesn’t mean she couldn’t be a brilliant savant and a prostitute. But I think the odds are against it. Of the remaining 50% of our doctoral cuties –those over 22 years of age– about three quarters could not spell correctly the discipline for which they supposedly received their advanced standing. Most common was the ubiquitous and popular field of “Psycology” [sic]. Up next was that arcane and mysterious discipline, “Phymacy” [sic]. Peppered among them (and indeed throughout about half of dating profiles I’ve perused in my time) is the ubiquitous use of the word “women” as a singular instead of a plural. For example: “I am a women who enjoys blah blah blah.” What up wit dat? We shan’t comment on the remaining two candidates who could spell adequately. (Yes, two.) They are each fine women, I’m sure, just not my type. There are those among you who will assume that they each had more than 4 cats apiece. I will neither confirm nor deny such speculations. For the record, I own no cats. But I do have eight computers, an X-Box, a complete Rock Band kit and two Guitar Hero guitars. And I know pretty much everything there is to know about both Bruce Lee and Star Trek. According to some, that’s the male equivalent of having 4 cats. How’s this for Pullitzer-worthy photos? A Chinese ship successfully fought off Somali pirates using Molotov cocktails. While they battled for their lives, one of their less useful shipmates took photographs. 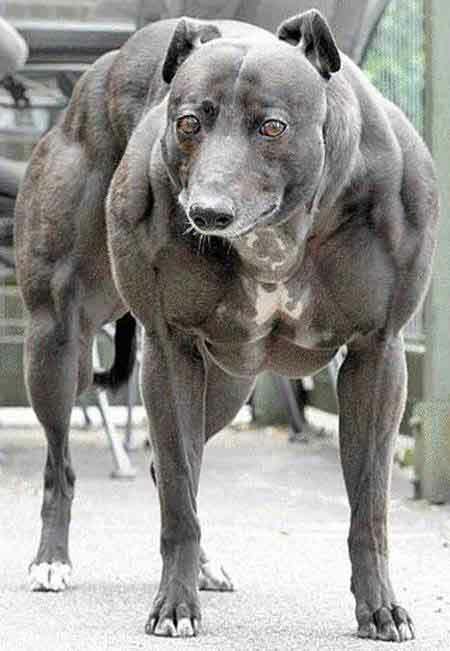 Lastly, here’s a pic of the world’s strongest dog. This is not photoshopped. It’s a real dog living in Victoria, BC. Read about her here.